Send Photo of John Thomas Leslie, Jr.
John Thomas Leslie Jr., 87,born August 6, 1922 to Annie Lou Ida Hudson and John Thomas Leslie, passed away July 1, 2010. He was a veteran of WW II, serving in the US Army Air Corps. He was preceded in death by his wife, Thelma Ellsworth Leslie, son, Michael Leslie, and son-in-law, Ben Lyman. He is survived by his six sons: Matthew Leslie, Michael (Susan) LeSueur, David (Nancy) LeSueur, Paul (Jacque) LeSueur, Chris (Linda) LeSueur, Ted (Elizabeth) LeSueur; two daughters: Ann Carter, Lori Lyman; 31 grandchildren and 53 plus great-grandchildren. He is also survived by a sister, Grace Menhenett, and brother, Bill Leslie. 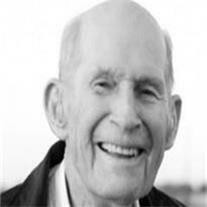 Visitation will be Friday, July 2, 2010 from 6:30–8:00 PM at Bunker’s University Chapel, 3529 E. University Dr, Mesa 85213. Funeral services will be held Saturday, July 3, 2010 at 10 AM with a visitation at 9 AM at the Maplewood Chapel, 18305 S. Greenfield Rd in Gilbert.